Foamtec system was developed and patented by Santoemma as a revolutionary system to clean and sanitize public restrooms, by foaming, rinsing all surfaces and vacuuming, using a single machine. Foam ensures an extended chemical action on the dirt and bacteria and is therefore ideal for many places which need an heavy duty action. 4. 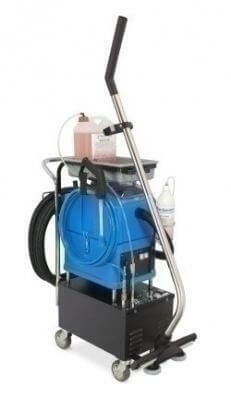 Vacuuming of residual liquid from floor. Reduced power consumption : the machine requires little electrical power and therefore it can be used in any places. Standard accessories supplied with the machine: Spray hose, foam/rinse gun, vacuum hose, pane wiper and fleece with extension, wet vacuum tool , tool for vacuuming while rinsing.